Earlobe stretching became trendy about a decade ago. But now some who bought into the look have grown up, entered the workforce, and want to reverse a decision of the past. For many, the only option is surgery. Dr. Julie Khanna inspects Kurt Barnett's earlobes. Both have big holes surrounded by droopy, thinned flesh. "We're going to cut a piece here, cut a piece here, close the opening here," the plastic surgeon informs her patient at her Oakville, Ont.-based clinic. Twenty-five-year-old Barnett is about to undergo surgery to patch up his holes, a procedure growing in popularity with those afflicted with earlobe-stretching regret. When he was 19, Barnett picked up on a growing fashion trend. He pierced his ears and then began the long, painful process of stretching the tiny holes. He stopped two years later when his gauged ears were 4.4 centimetres in diameter — big enough to accommodate large round jewelry or spacers. 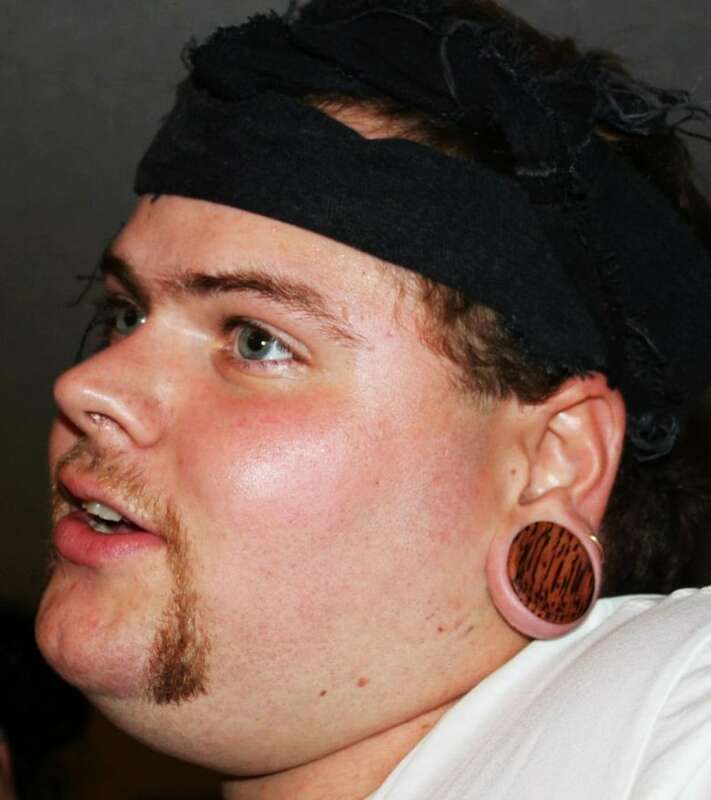 Kurt Barnett wearing his spacers after he stretched his earlobes to 4.4 centimetres in diameter. (Kurt Barnett)The body modification, sometimes called earlobe gauging, became trendy about a decade ago. But now some who bought into the look, like Barnett, have grown up, entered the workforce, and want to repair a folly of the past. "I'm actually very excited just to have my ears back to normal, instead of these big open holes in my ears," says Barnett, who lives in Aurora, Ont. Sometimes, surgery is the only solution to fix a stretched ear, especially if the holes are big. Not only must they be stitched up, the surgeon has to reshape the lobe — often by slicing off excess stretched skin. "I've seen patients who are really surprised you don't just take the spacer out and it goes back to normal," Dr. Khanna says. The surgeon says she's seen a surge in patients requesting the procedure. It's one of many fuelling the booming cosmetic surgery industry, where a growing number of Canadians are opting to alter their looks. "As you change, as you enter the workforce, you may not want to have that permanently," Dr. Khanna says, "and that's when people start thinking about how can I correct it?" Barnett says he was once happy with his gauged ears. "I loved the way it looked, the attention, everything like that." But he stopped wearing his spacers soon after he landed a job doing spray-foam installation. The holes were so large, Barnett couldn't properly fit a required respiratory mask over his head when wearing jewelry. So he removed his spacers when at work and then decided to permanently leave them out. "I just kind of got used to not having them in and didn't really see a point of putting them back in if they were going to interfere with my work." He adds, "You could say I fell out of love with them." But soon he had a new problem. Without the aid of jewelry, Barnett's earlobes sagged and he went from a look he loved to one he found embarrassing. So he signed up for surgery. 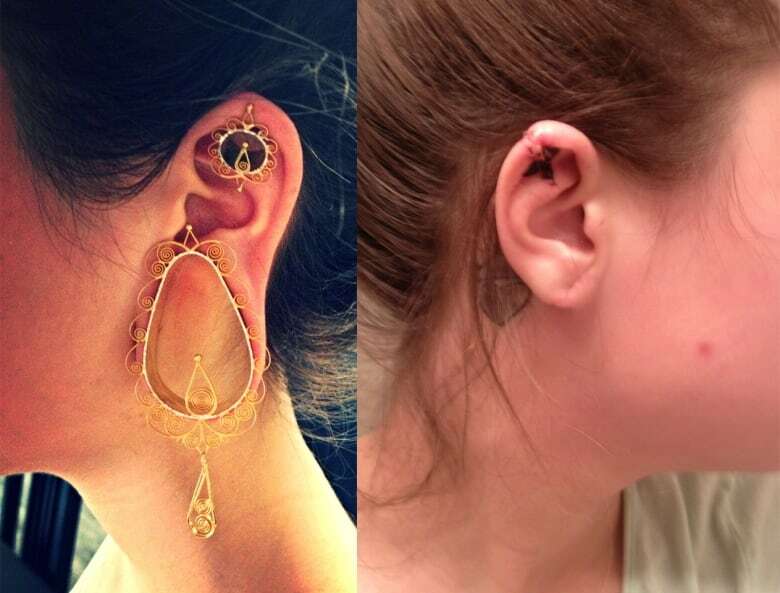 "I don't really want to have these big huge holes in my ears because it just looks horrible. Every time I look in the mirror, I just see it and shake my head," he says. Barnett will shell out $1,700 for the procedure. He says he always knew surgery was the only solution if he changed his mind about ear-gauging, but he believed it would be a simpler process. "I thought they'd pretty much sew it up, but there's going to be earlobe removal, stitches, and a lot of pain afterwards." Leanna Richard's ears before and after ear fix-it surgery. (Submitted by Leanna Richard)Twenty-four-year-old Leanna Richard recently endured two different surgeries on her ears. When she was 15, she started stretching her lobes until they were 3.8 centimetres in diameter. She also got a 1.3 centimetre hole punched out of the tops of each ear. Richard says she still loves the look of gauged ears, but decided to go under the knife because it was no longer right for her. "I think it's really beautiful. I just think on me I didn't like it anymore, just kind of grew out of it." She also decided normal ears would make life easier while attending nursing school in Edmonton, where she believes not all the instructors are fans of stretched lobes. Richard went to a facial surgeon, Dr. Kristina Zakhary in Calgary, and paid $3,800 in total for both procedures. "It was a bitter pill to swallow," she says about the expense. But she's thrilled with her regular-looking ears and the new accessories she can wear after getting them pierced, post-surgery. "I love wearing little jewellery now, like little hanging earrings." Back in Oakville at the Institute of Cosmetic and Laser Surgery, Dr. Khanna snips a piece of Barnett's earlobe and starts stitching his ears back into shape. Kurt Barnett two months after undergoing surgery to patch up the holes in his ears. (Kurt Barnett)When she's done about 45 minutes later, Barnett cringes at the two leftover pieces of lobe sitting on a table. But his mood changes when he checks out his new ears in the mirror. "I'm really shocked that I have normal looking lobes," he says. "I like it." When Barnett's ears completely heal in about three months, he'll only have a faint scar reminding him of his former look. But he's not yet done. Barnett wants to make a documentary about his journey to help young people considering earlobe stretching. He plans to lay out the process and the consequences if they later change their mind. 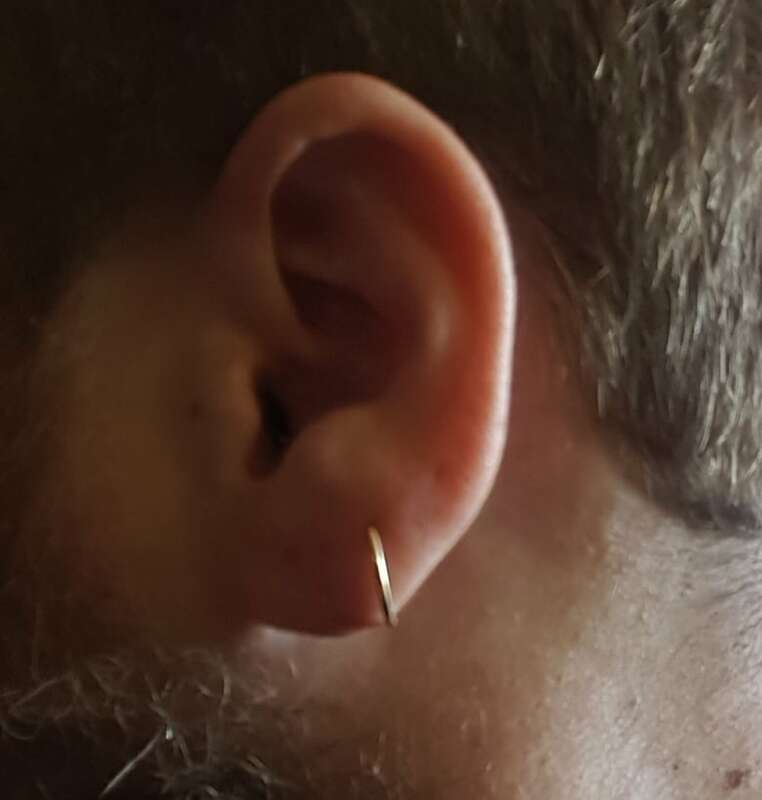 "The problem is, nowadays it's so common for people to stretch their ears, and I'm just not sure if people are aware of the repercussions," he says. What's the story behind your 'body art'?